Moody’s and Fitch both affirmed their AAA credit ratings on Aug. 2, after President Obama signed a bill that ended the debt-ceiling impasse. This downgrade by S&P is the first ever in the rating history as the United States has held S&P’s top triple-A rating since 1941. On one hand, Washington probably had it coming by handing S&P one necessary ammunition–the Political Soap of the American debt ceiling debate, but on the other hand, I would not give that much credence to S&P’s claim that “it’s our duty to make that call” either. First, there is this ‘basic math error’ of $2 trillion made by S&P that the U.S. Treasury found (and acknowledged by S&P). But is this $2-trillion error significant? S&P apparently does not think so. However, a lot of the much publicized rationale behind a downgrade action is that S&P is expecting a $4-trillion deficit cut from the U.S. in order to keep the AAA rating, whereas only $2 trillion reduction (over the next 10 years) was included in the debt ceiling deal. So it would seem with this $2 trillion error corrected, the U.S. would have made that $4-trillion mark S&P is looking for. Basically, according to Treasury Department’s account, after its ace card got taken away, S&P still went ahead with the downgrade, and deleted the justification portion in its document referencing how the U.S. misses the $4-trillion deficit cut that S&P deems necessary to maintain the AAA rating. Treasury Department’s dispute aside, what is not in dispute is the error made by S&P, so this whole drama just makes S&P’s findings less credible (i.e. what else might have been wrong?) considering the agency has had weeks and months to work their numbers for such an important decision, yet it only took the Treasury Dept. a few hours to spot the glaring error. Primary Focus is 3-5 years, not 10 years? According to a CNBC report, amid the $2 trillion controversy, S&P put out a statement last Friday evening saying that its primary focus in judging creditworthiness is ‘3 to 5 years, not 10 years’. That’s even more questionable as S&P affirmed the top short-term rating of the U.S., but downgraded the long-term credit rating. So the $2-trillion error, dismissed by S&P, should have been a significant factor in the long-term credit risk profile of the U.S., which is the one got downgraded. This simply demonstrated more inconsistency, and seemed to suggest that S&P had made up its mind beforehand with its own agenda. Not to defend or affirm Washington politics, but this is how the U.S. political system operates since the beginning of time, and just about how every other Western government works as well—two sides agree, disagree, and argue–that’s the democratic system. Neither the GOP, nor the Democrat would really risk a historical watershed event such as a technical default; it was just a political power showdown. It is flawed, but nevertheless does not really add to the credit risk of the U.S. And if S&P does not understand the intricacies of the U.S. political system, and cites it as the main downgrade rationale, then the frustration expressed by the Whitehouse that S&P is quite unsophisticated when it comes to the U.S. political process does ring true. .
Why such a rush to a cross-continent ‘emergency conference call’? Why not just take a few more days, or even a week to re-crunch the numbers? As it turned out, there might be a reason for the mad dash. According to the Wall Street Journal, word of an imminent downgrade was already ‘leaked’ on the morning of Friday, Aug. 5, which was one of the factors for the stock markets selloff. As usual, retail investors were the last to know, and once again, Wall Street seemed somehow to know way ahead of even the Whitehouse and Secretary Geithner as nobody sells off 500 points on Dow based on ‘rumors’. The market selling action was so decisive which suggests the downgrade decision was leaked earlier in the week, and most likely a few powerful players with ‘previleged information’ made tons of money on the kindness of somewhere or someone that could be traced back to an S&P source. With markets already acting on and anticipating the downgrade, S&P’s hands were tied and basically had to deliver on its promise–$2 trillion math error notwithstanding–by Friday or the agency’s street cred (what’s left of it after the subprime debacle), would be in real jeopardy. Spain As Creditworthy As The U.S.? Furthermore, it is a total joke when S&P put the U.S. in the same ‘Double A’ family with Spain. Yes, Spain, the ‘S’ of Europe’s debt-ridden PIIGS countries, has a 20% unemployment rate, a far more severe NEAR-TERM debt crisis and ongoing bond rout. 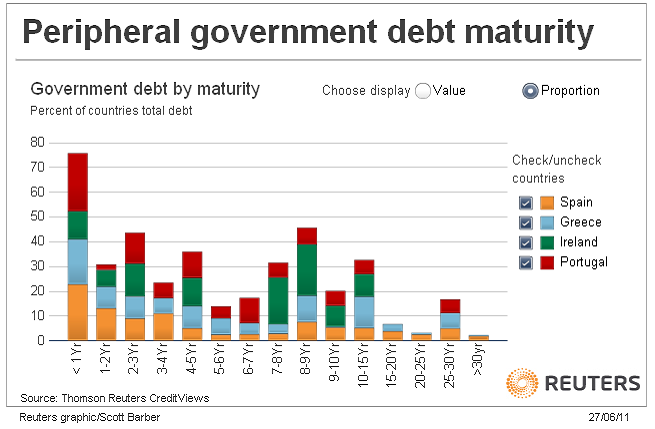 Given that $187.3 billion, or almost 23%, of Spain’s debt is due in less than a year (see chart from Thomson Reuters), and considering the Euro Zone crisis contagion fear, I seriously doubt the Spanish risk profile is comparable to that of the U.S. thus putting into question the basis of S&P’s rating methodology. Spain, after all, is hard pressed to be even mentioned in the same sentence (regarding credit risk), let along sharing a similar credit rating as the U.S.
With hundreds billions worth of U.S. Treasury traded daily in the markets, the creditworthiness of Uncle Sam is under constant scrutiny by many with vested interests. As I noted before, ultimately the markets hold the key to a sovereign’s creditworthiness. 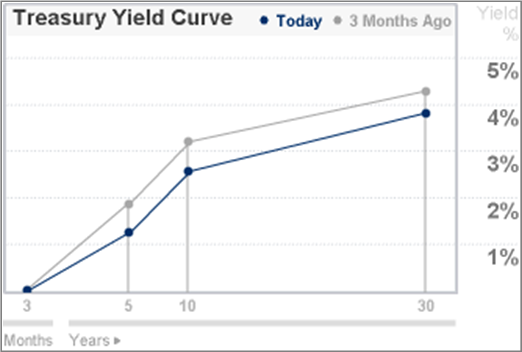 Judging from the U.S. Treasury yield curve (see chart), the markets do not see a problem with U.S. solvency. So the bond markets are also disputing S&P’s downgrade. Providing years of rhetoric material between these pairs–GOP/ Dems; Washington / Beijing. Giving countries like UK and France bragging rights with their AAA ratings, despite the fact that their fiscal risk profiles are considered worse than that of the U.S. by the fiscal riak index from Maplecroft based on their demgraphic and productivity profiles. The consequences of U.S. credit downgrade could include higher interest costs for the federal, states and local governments, business and consumers, higher inflation, lower GDP growth (learn more here). Granted the U.S. does have some serious debt and deficit problems that need to be addressed with an inefficient government structure in serious need of an overhauled, and probably would warrant a credit downgrade, BUT NOT for the rational cited by S&P. This S&P downgrade not only provides very little that’s constructive to the already known facts, but also could send shock waves and disruptions through the global financial system as markets are already fragile and spooked by global stock market’s biggest drop since 2008 in last week. Market-wise, we could expect some near-term downward pressure (probably with the exception of gold and maybe silver) due to this downgrade, and if Europe does not get their act together, it remains to be seen if global markets could handle a twin crises, and from that persective, a global coordinated QE could not be ruled out. For now, Bloomberg cited major iBanks including JPMorgan Chase & Co., Citigroup Inc., Barclays, and UBS AG that a drop of the Treasury, dollar from the ratings cut is unlikely to be “sustained,” or “significant”. In addition, because S&P left the U.S. short-term credit rating unchanged, U.S. long term AAA rating is intact at the other two major rating agencies, along with the joint statement by bank regulators including the Federal Reserve, and FDIC that S&P’s downgrade decision won’t affect the capital positions of the nation’s banks, hopefully should all provide further support and stability.